June 1968. Pic via Mirrorpix. 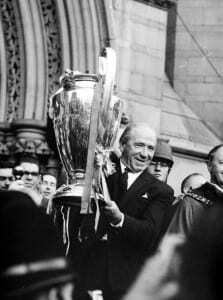 Sir Matt Busby is one of football’s greatest managers. Over 25 years as manager of Manchester United he led the Old Trafford club to post-war domestic dominance and European glory. Using a combination of youth development, carefully considered signings, strong leadership and partnerships with coaching staff, Busby was able to make Manchester United one of the world’s most successful football teams. His management style relied on having complete control to develop young players through a carefully organised recruiting system. Alongside his excellent coaching staff Busby used his instinctive understanding of the game to build a series of youthful but brilliant teams. His young players were supported by the signing of influential players such as Tommy Taylor in 1953 and Denis Law in 1962. The discovery of George Best by United's scouts in 1963 added maverick creativity to an already potent front line. The combination of youth development and clever signings defined Busby’s career and gave United prolonged success. In 1945 Busby took charge of a Manchester United team that was suffering from the effects of the Second World War. Despite this, United won the FA Cup in 1948, the club’s first major honour since winning the League in 1911. This early success was followed by dominance of the League throughout the 1950s and 60s. United won the League five times in this period. Perhaps the most defining characteristic of his career was Busby’s attraction to the challenge of European football. In 1958 United entered the European Cup after winning the League and being runners up in the FA Cup. 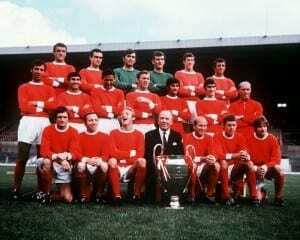 The young age of league-winning side had led the press to nickname them the 'Busby Babes'. After a quarter final second-leg tie against Red Star Belgrade, the plane carrying the team back to England crashed shortly after take-off from Munich, tragically killing eight players and ending the careers of two more. Busby himself suffered very serious injuries, and is said to have twice received the last rites in hospital. European Cup Winners 1968. Pic via Mirrorpix. The disaster, however, did not cause Busby to abandon his European dream. After recovering from his injuries he again worked to develop a new team of youth and brilliance that included astute signings like Denis Law, George Best and one of the original 'Busby Babes' in Bobby Charlton. Busby's rebuilt team were FA Cup winners in 1963, and league champions in 1965 and 1967. In 1968, a decade after the decimation of the 'Babes', Manchester United beat Benfica in the European Cup Final at Wembley. Matt Busby was knighted in the same year. He announced his retirement in 1969.